Dr. William Havlicek is professor at the Laguna College of Art and Design in Laguna Beach, California. He holds a Ph.D. in aesthetics from Claremont Graduate University, is a studio artist and one of the leading experts on the life and art of Vincent Van Gogh. Scott Rae:Welcome to the podcast Think Biblically, conversations on faith and culture. I'm your host, Scott Rae, dean of faculty and Professor of Christian ethics at Talbot School of Theology, Biola university. Sean McDowell:I'm your co host Sean McDowell, Professor of apologetics at Talbot School of Theology, Biola university. Scott Rae:We're here today with my good friend, Dr Bill Havlicek, who's a professor at the Laguna College of Art and Design and one of the leading experts around the world in the art and the life of Vincent Van Gogh, particularly, the connection between Van Gogh's art work and his vibrant Christian faith. So Bill, I think it's fair to say that Van Gogh has been at least a major part if not the major part of your life's work. 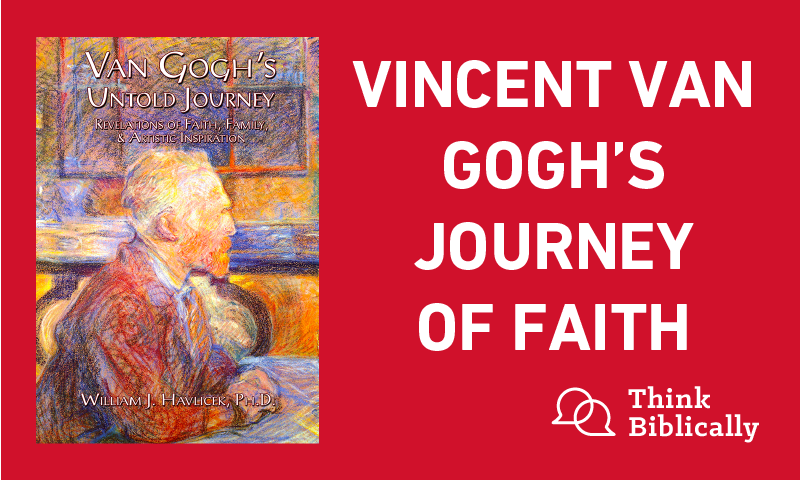 Your book 'Van Gogh's Untold Journey' is just a terrific book which I'd recommend for all of our listeners, in fact we'll post a link, listeners can order that as a part of our podcast. But how did you come to your interest in Van Gogh? Bill Havlicek:It really began in 1967, when I was a 20 year old student, that gives the listeners some idea of my age, I'm 70 now. But I was living in Holland, I was a [two 00:01:23] year abroad student. And I was able to see Van Gogh paintings and drawings for the first time in the flesh, having seen them in art history books and all of that. And the difference between seeing a reproduction and seeing a Van Gogh in reality is the difference between night and day. And I'd say my interest began there. The seed was planted, and then while I was serving in the military, especially working as a psychiatric orderly which I did during the Vietnam war, I was stationed in an army hospital, medical hospital. I started to see the effects of drug use and things like that, some of the effects that Van Gogh himself experienced at [certain 00:02:09] points of his life. And after I'd left the military, I went on into graduate school, the graduate programs and the thought of doing a thesis, some sort of research on Van Gogh started to really grow in me. And after some years of teaching and working as a museum curator I decided to go into a doctoral program and Claremont Graduate University and the topic for my dissertation was Van Gogh's letters and the idea was to look at them as if they were a magnifying glass that would reveal a lot of the ethos, the ideas and the energies of the 19th century. And so the book came out of that doctoral program. Fortunately I was picked up by a publisher who liked very much the published thesis, but in a very sweet, kind way said 'Look, the quotes from [Hegel 00:03:09] and someone like that are not going to probably appeal to a lot people. So what we want to do really do is re write this book. I'll help you with this, we need to really develop it so it has broad appeal. So that it sells well because we're supporting the Endangered Children's Foundation which we have with the book.' So it began in Holland, living there and it began through identification through working on a psychiatric ward and that sounds rather extreme. But what I saw there was actually a lot of healing. People often think of a psychiatric ward in a very negative way, I saw a lot of soldiers coming out of that hospital as really redeemed people in a lot of ways, positive ways. And I saw that in van Gogh's life too. There were periods of amazing lucidity and clarity. And other times when he was in a very dark place. And he wrote about this in such a beautiful way, his letters. And really started to move me, having been moved by the painting, that's one thing. But to be moved by these confessional, highly, well thought out letters is really extraordinary. I could talk long about his reading habits and the range of interests in those letters, which is extraordinary. There's 902 of them, by the way. And they're usually multi-page. So, you take 902, maybe multiply by three pages, you suddenly realize you have a tremendous amount of material for a research project. And so when I brought this to my doctoral committee, they said "This is really gritty. There's a lot of material here that you could use that could make a very interesting thesis and an interesting book." So that's how it really happened. Scott Rae:And having read Van Gogh's Untold Journey, I can attest to the fact that it is a very interesting book that tells a lot of things that are not well known to people in the general public. So, one of the things that you bring out in the book is Van Gogh's background, I think is pretty unknown for the most part, except for people like you who've read all his letters. What was his family like? His upbringing? And how did his family shape him, both as a person and as an artist? Bill Havlicek:That a good question and it's a complicated question. Because there was both a positive shaping and a more resistant shaping, against a fairly strong father and a typically strong son. And any typical male who has been through that, realizes that sons sometimes challenge fathers. I think it's a part of our own maturation and that did happen. So really quickly, the family was a Dutch Reformed family. His father was a pastor. He came, no only, from a father who was a pastor, but he came from a family of welfare ministers. His grandfather was also a pastor for the poor. And he would often go with both his father and grandfather to deliver packages and do healthcare and things like that. There also was medical training. Because very often when they were on one of these trips, someone would be very sick. So Vincent and his father and grandfather might be providing medical care, which is pretty amazing. And so that part of the family was very positive. Vincent wanted to be a pastor like his father. And had aspired to go to the University of Amsterdam and study theology, which he did for a while. He actually ... I need to preface that by making this comment. He wanted to get into the program, so he was doing an independent study with a mentor, who was teaching him to do Hebrew and Greek and all the other kinds of translation work that he needed for that degree. But by the time he got through with probably close to a year or two of that kind of activity, he wasn't quite sure he wanted to get the degree. So that's a whole other thing. He got into a situation where he was a lay minister to minors and attempted to preach and so on. And that wasn't always a successful thing for him. But anyway, it turns out that also his family were very much floral gardeners. They were people who had a great deal of interest. He also had uncles and others who were art dealers. So there was a rich mixture of theology, very practical welfare ministry, floral gardenry. He lived in a rural area in Rabon, near the Belgium border. He connected a lot with people like peasants and farmers. So when you really try to picture his upbringing, he had uncles who were high ranking clerics in Amsterdam, well known pastors with big churches. His father had a small church. He was working with farmers and probably working part-time as a young man in that kind of community. So it was a rich mixture of art, labor, heavy reading. He was a great lover of reading. He loved Dickens and was a very bright young man. So I would say, very stimulating childhood in many ways. 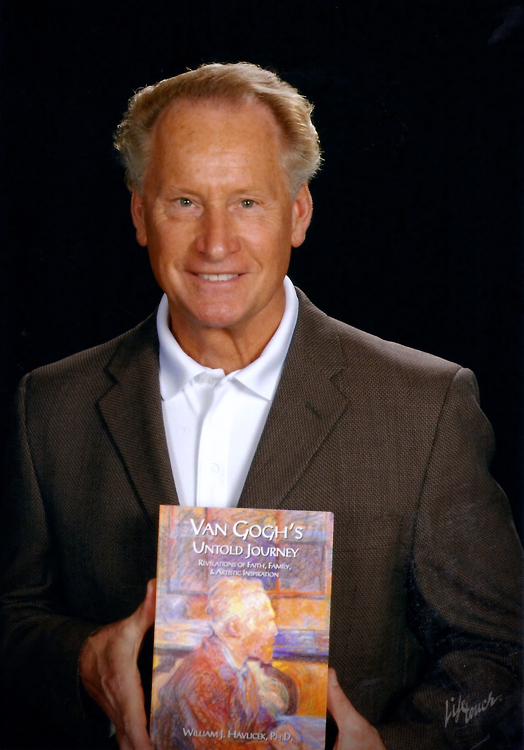 Scott Rae:Your book is entitled "Van Gogh's Untold Journey." Most of which by which you mean his faith journey. Tell us a little bit about Van Gogh's spiritual life. And how do we know about his spiritual life? Bill Havlicek:Well, that question could be asked of anyone, if you think about it. Only the Lord really knows someone's heart. That's what we believe. And then you look at their behavior. His behavior was based on loving his neighbor as himself. He believed that was one of the great callings, one of the great, what we would say, moral laws. And he was all of his life, very much concerned about others, showing care for others. And very generous with his time. He often gave money and help to people who were very poor, and this kind of thing. We know, for instance, he lived in London. We know that he attended, I believe it was Spurgeon. There were evangelists who were working there with tent evangelists and things like that. He talked about taking an altar call. He talks about having Jesus in his heart. He talks about when he is a young man, after being in London and so on, wanting to devote his life to Christ. Throughout his life, he was challenged even later, after and since leaving the church, not feeling comfortable with the church structure and all of that. He continued to refer to Jesus as the ultimate, that he was the only one who could really change or transform a life. And if someone would speak disparagingly of Jesus, he would challenge them. So we know throughout his life, he did. For instance at the very last months of his life, he was making several paintings that were overtly religious. One was the Good Samaritan. Another was the Resurrection of Lazarus. He was making paintings that were based on prints or etchings or lithographs by the great artists. But he would transfer them into full color and then paint them in his own interesting way with brilliant color. And by the way, he put his own face on the face of Lazarus, who was being raised from the dead. And he did believe in the resurrection. He was a very strong believer in the resurrection, it meant a tremendous amount to him. And in a way, his upbringing as a Dutchman, plays a role in this. Because the Dutch are very tactile people, more than most cultures. Because they have been exposed to a great deal of flooding, as you can guess. Because they are below sea level, they had to reclaim a great deal of their soil. So, things that are solid and substantive mean a great deal to the Dutch. And their houses are built of brick and all that kind of stuff. So for Van Gogh, the physical resurrection of the body was a very big deal. He wrote about it and talked about it a great deal. And I think it's one of the reasons why he liked to paint. Because paint allowed him to express a lot of his spiritual yearning into concrete form. And in it's own way, it's like a minor resurrection, when you think about it. An artist has an idea. He's inspired deeply and he begins to shape or craft that idea into form. Something like the creation when you think about it. More than that, it is a creation, surely. But it is not unlike the incarnation in a minor way, of course.And Van Gogh was aware of the implication of that. Scott Rae:Can you give us some principles as to how people can look at his art and see some of the deeper meaning that he's drawing? For example, putting his face on Lazarus is pretty clear, kind of hard to miss. Is he always that obvious? Is he sometimes subtle? What principles could we take to understand how religious shapes his art? Or even the ideas he's portraying in art? Bill Havlicek:Good question. Certainly the subject matter and kind of references that he had in reading were often principle driven. For instance, one of the sources that moved him a great deal at the end of his life was the book, Les Miserables, and of course, the Bible. Van Gogh knew the Gospels very, very well and could quote them. And he had a very good memory. He loved the Gospels in particular. And so throughout his life, he would make reference to these Gospels. For instance, he wrote in a letter, "Sorrowful [inaudible 00:13:33] but always rejoicing. He loved Paul. He liked the militant quality of Paul. He liked the principle of enduring difficulty without complaining so much. And I think his paintings reflect that. They are very beautiful paintings and they are filled with passion. And probably one of the things that's moving about Van Gogh, and we'd say in a principles way, is that instead of creating work that's dark and troubling, it's almost always extraordinarily beautiful. As one person said, "In a way his whole life is a spiritual journey, expressed in the beauty of suffering." And he definitely did undergo suffering. He suffered from a form of epilepsy, of grand mal seizures. He also had periods where he didn't eat properly. He simply wasn't getting a good income and things like that. But the general theme of his life is redemptive. That he would use his work to move people in a positive way. He wanted to leave his work as a legacy for others to continue on the journey of life without despairing. And I know you're probably thinking, then what about the suicide? And we're going to come to that question, because there are now questions about whether or not it really was a suicide. Scott Rae:Yeah, that does. And you've kind of intrigued me. And the next question I have to ask about now, which is his suicide ... Or at least that's what we've commonly been told. Bill Havlicek:Well, any time I do a lecture on Van Gogh, that's almost always one of the first things that is brought up. There's two way of answering the question. Obviously, he did or he didn't commit suicide. The traditional view has always been that Van Gogh did take his own life. And it was after [recognizing 00:15:37] that he would probably be suffering [inaudible 00:15:39] with epilepsy [inaudible 00:15:40] his life. And so, he may very well have taken his life. In addition to that, his brother [inaudible 00:15:50] had a child, obviously. And they [inaudible 00:15:55] quite supported him in the way they had previously to his. So Vincent might have, in a very altruistic way, decided that the best thing was to end his life. Because he was also experiencing real difficulty in drawing. He was losing a lot of his eye/hand coordination. There's a lot of different reasons for this. So there is a good possibility that he did take his own life. However, about a decade ago, a gentleman who was in his late 80s, feeling that his life was coming to an end, wrote a very confessional letter. And he explained that he was one of several boys who were harassing Van Gogh while Van Gogh was in the town of Auvers-sur-Oise, where he died. In fact, if you had seen the film Loving Vincent, you will see these boys hitting him with rocks, putting a snake in his food basket. And just basically making his life really miserable. And this really did happen. This is what the gentleman was confessing in this letter. He also said that they had a pistol, and an unfortunate event did occur with this pistol, something of this nature. And what it suggests, is that accidentally shot him. And what's interesting in Van Gogh's own letters, he said ... There's at least twice in his life where he took the blame for someone else. He had this very self-sacrificial aspect about his personality. And I remember when I read the letter of the gentleman I was talking about, perhaps accidentally shooting Vincent, that Vincent was asked by a local policeman after he was shot, and was in his bed and dying, how this had happened. He said, "I've been shot. Don't look for anyone else." And that's actually included in the film, Loving Vincent, this little vignette that I just told you about [inaudible 00:18:03]. In fact, if you see the film, you'll see there is a discussion, "Why would someone say that if they shot themselves? Why would they say 'Don't look for someone else?'" My own theory is that it's very possible that he was accidentally shot. My own theory is that, knowing that he did have this very pragmatic, self-sacrificing part of his self, he would have very easily taken the blame for this, because these were young boys. They could have gotten into some serious trouble. And I think he knew he was mortally ill. Because he had been around people dying. He had this welfare background as a ... With medical training. He had worked in the Borinage mining community, where people had died. He'd seen people die. He knew he was dying. And I'm starting to lean more and more in the direction of it being an accidental shooting, if you want to know the truth. Scott Rae:I'm glad you mentioned the film, Loving Vincent. We saw that in addition to being an artistically beautiful film, that is how it was portrayed. At least that's a plausible explanation. Hey, let me ask you about one of his most famous paintings, the Starry Night. You make the case, it was a really deeply spiritual painting that reflects the Gospel message. What were some of the influences on Van Gogh for this painting? And how do you see the gospel message coming out in this? I wish we had the painting in front of us. It's a little hard to do on audio only. But I think a lot of people are familiar with what that painting looks like. Bill Havlicek:Well, briefly, anyone knowing the painting knows that it's really blue. The sky is full of brilliant stars and a moon that is a strange combination of a crescent moon and almost a sun. A very curious, brilliant object there. And then below is a landscape that looks as though it were almost crocheted, as much as painted. With a cypress tree rising up. And in the very center of the picture is a spire of a little church, very similar to the kind his father actually ministered in. So when you start looking at it, you also notice that there are clouds that spiral down from the sky, among the stars. Almost as though they are scooping up the earth and bringing it up into the sky. Van Gogh said at the time that he painted it, that he had always wanted to paint his starry night. And he made a reference to Les Miserables and a bishop in that book. And so as I was doing my research, I uncovered a fact that I had never found before. In fact, I don't know of another artist who had ever noticed this. That there is a very strong chapter, I think it's chapter two in Les Miserables in which the phrase "the starry night" appears in French. And it is a night of meditation by a bishop who would go out into his garden at night and look at the night sky and pray. And so the description of what the bishop sees is very similar to the starry night that Van Gogh painted. And Van Gogh was reading Les Miserables at the time he painted it, as I said. And he had read it before, but at the end of his life, having had epilepsy and his health being undermined, I think he was moved by it all the more. And so he saw the starry night as deeply religious. Because he said himself, "I have a terrible need for religion." This is a direct quote. "I have a terrible need for religion and I don't feel comfortable going to church as in the old days. So I go out and I paint the night sky. And in a sense, I meditate on the beauty of it and I feel very much close to God." And the meditation in Les Miserables is absolutely beautiful because it talks about the bishop lifting up his heart and soul to God, as though there was a reassurance that he felt in the presence of that spectacular beauty, that God existed. That there was a creator. And I think Van Gogh, at the end of his life, also said he pictured death as taking a train to a star. So we know that at the time he painted this, he was thinking about the possibility of dying. And he also wrote to a friend after he had finished the picture, that the inspiration of port, had a lot to do with the nature of Jesus, who redeemed all mankind. And he said a very beautiful thing. He said, "Christ alone is the greatest artist. Because instead of working with clay or brushes and paint, he transforms men into immortals, and in a sense, resurrects them and makes them into eternal existence." He said, "No painter can be better than our Lord, the greatest artist there ever was." And so those are the kinds of things that he was thinking about and writing about when he was painting it. And so we have his own comments about the picture, which is very unusual. Most of the time, we speculate about the meaning of a work of art. We don't have an artist's own words for it. But in Van Gogh's case, we do. So we have very good reason to ascribe all kinds of meanings to it that Van Gogh himself gave it. Scott Rae:Since the sky is so alive and vibrant in that painting, and yet the church is right in the middle in the valley and it's dark, was he criticizing the church? Because someone said that his painting the church, which seems to be a painting of a church without doors, that he was critical of the church itself, but still saw God in nature. Is that accurate? Bill Havlicek:Yeah, I'd say that's quite accurate. He had been fired by a synod of clerics after he had worked for about two years as a lay missionary in the Borinage region. And they fired him because they didn't feel that he dressed properly and conducted himself as a well dressed minister should, with a top hat and frap coat. After seeing fire damp explosions and people severely injured, Van Gogh started to wear the clothes of a martyr. He said, "These people can't relate to big shots walking around with canes and fancy clothes." And he said, "I do not believe the Lord would have worn those kinds of clothes." His clothing was very much that of a common person. And Van Gogh was very smart about this kind of stuff. And the people who fired him showed really a lack of understanding of the minors themselves. After he was fired, the minors complained. They said, "Pastor Vincent was the only pastor we really wanted, who seemed to care and wanted to share in our lives. And we are sorry that he was gone and we missed him." And Van Gogh held it against the clergy. When he came back home, his own father was a kind of ... In a way, his father didn't know how to [inaudible 00:25:12] with his son losing his job. We'll put it this way, and didn't defend him or explain the circumstances to his own parish. So here's his son coming back from the mines, not in the best health, and feeling as though his father had, in a way, abandoned him, along with the clergy. And from that point on, he did not attend church. But I don't think he ever lost his faith. And let's face it, many people, even some listening to this broadcast may be in the same situation. Scott Rae:Bill, one last question, and then we'll conclude. You've long been a champion of the place of the arts and a vibrant Christian faith. What would you like to say to both the church corporately and then to individual believers about the place of the arts in someone's Christian life? Bill Havlicek:Well, when we read the book of Genesis, the first thing we recognize is that God is creator. He created all things, right? And one of the mandates we now call the cultural trend mandate or the creation mandate, the Lord telling us, Adam and so on, to take care of the garden. And then after that, to have lordship over creation, animals and so on. Also to be fruitful and multiply, right? And so being fruitful and multiplying means that people are going to eventually have a lot of people and they're going to have to live somewhere. And so cities come naturally into the game. New Jerusalem and Old Jerusalem. And so there are places that people must live. And if people are living together, they will have a vibrant cultural life. That's going to be a part of the cultural and creation mandate. That we are to do culture together. That we create things of beauty together. That we take care of the garden and we enjoy the beauty of nature. But we also have creative inclinations. And as one of the great [inaudible 00:27:11] said, "The arts seem to grow naturally out of the creation emphasis and beauty in nature. We have a desire to create beauty and it's an extension of what the Lord already began with so much beauty. I mean, you look out the window and see all of the trees and flowers and birds and ... The variety and richness and lushness of nature is staggering. The tropical fish are so beautifully colored, and we just go on and on and on about the amazing color range of birds and things like that. And so [inaudible 00:27:47] explains it this way, for the Christian, it is natural to love creation, because God created it. And it's also natural to want to create. Either children we create one way or the other, and for the artist and people who are involved in the arts, it's a way of continuing on the creation of creation itself. And it's a very interesting way of thinking about it. We continue to add, in a certain way, to the multiplicity of beauty that is already there. And people like C. S. Lewis have talked about this, Tolkien has talked about it ... Talked about the fact that in the book of Revelations, there are some very tantalizing references to some of the great kings of the earth bringing treasure into heaven. And Tolkien liked to speculate that some of the most beautiful things that were created by people in a loving, creative vein, that the Lord is going to cherish those things and want to have them in heaven, in the new heaven and the new earth, just as a parent would want drawings of their children. And I find that very plausible and I can imagine the Sistine Chapel being transported to heaven. And some of the greatest and most beautiful things ever created by Rembrandt and others in heaven. Believe me, heaven is going to be an amazing place if all of our theologians and writers and thinkers are right. Scott Rae:That makes a lot of sense. Why wouldn't we have beautiful art in heaven? That makes perfect sense. Sean and I so appreciate you being a champion of the arts. Scott Rae:But also your work on Van Gogh and his spirituality and how it's reflected in his art and his life. It's ... The journey isn't as untold as it used to be, before your book. So we're very grateful for that. So, thanks so much for being with us on this. It's incredibly insightful stuff. I hope our listeners have enjoyed this trip into the world of the arts, particularly the life of Vincent Van Gogh. Scott Rae:This has been an episode of the podcast, Think Biblically: Conversations on Faith and Culture. To learn more about us and today's guest, Dr. Bill Havlicek, and to find more episodes, go to Biola.edu/thinkbiblically. That's Biola.edu/thinkbiblically. If you've enjoyed today's conversation, give us a rating on your podcast app and share it with a friend. Thanks so much for listening. And remember, think biblically about everything.